The 3rd quarter comes to a close and we still have an uptrend signal. Hopefully the good times continue through Q4! 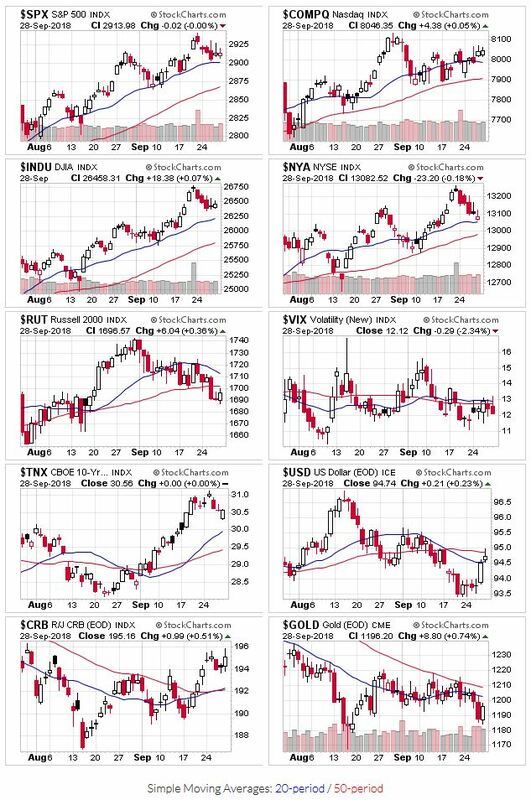 With the exception of the Russell 2000, all the major market averages continue to trade above their 20 and 50 day moving averages. The R2K trended lower the entire month of September, which is a bit worrisome considering it’s the “small cap” index and small caps tend to lead bull markets. 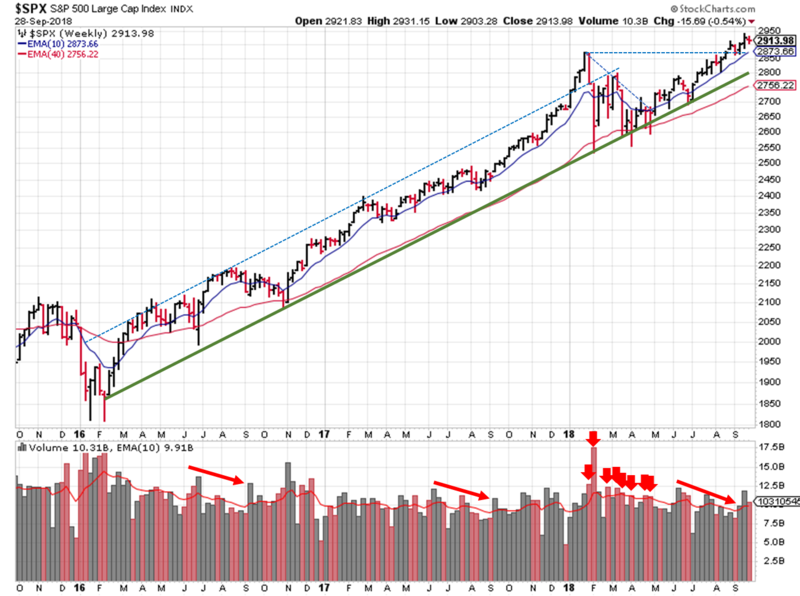 Some distribution last week, so the level of institutional selling is still elevated. No change in the signal this week, but trading volume and distribution days are another thing to keep your eye on going forward. While our target all along has been SPX 3000+ by 2018+, and it still may get there, we’re not one to try and pick the exact top. We scale in when we think a bull market is underway, and scale out when we think it is close to ending. 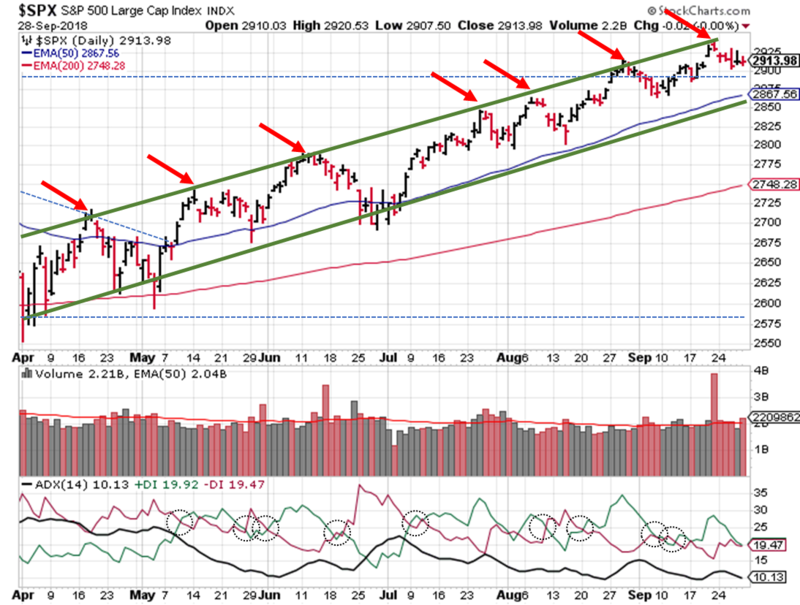 Moving onto our technical analysis, as expected, the S&P ($SPX) retreating after reaching the upper channel. We start this week closer to the mid-way point, but prices still haven’t tested the January high, so look for that level for support if we continue lower this week. The ADX fell last week, putting it back to recent lows. The DI+/- are roughly equal as well. No clear direction from that indicator for this week. The longer-term view remains the same and supports the case for an uptrend; trading volume returning and the January high supporting. With Q3 earnings still a few weeks out, I don’t see many upside catalysts. In fact, the trade war / tariff chatter may be just the thing to take us down a notch or two (the January high just below 2900 for the S&P or the 50-day) as discussed last week. It’s not time to sell the farm, so to speak, but consider trimming winners and taking profits from any trades you initiated back when this uptrend started in March/April.